Take this wonderful opportunity to be a part of the world’s leading enterprise for managing documents and business processes. 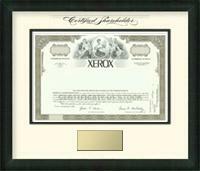 Purchase a single share of XEROX stock. Today, XEROX is well known as one of the largest providers of digital copiers. XEROX is also responsible for inventing such innovative items as the mouse and graphical user interfaces. XEROX also manufactures scanners, printers, and fax machines, and they offer a broad range of software services as well. XEROX stands by their commitment to exceptional quality from start to finish. When you make your purchase, your shares will arrive in pristine condition, unfolded and without defect. Each certificate is hand framed by expert artisan framers using only top quality premium frames. Both the artist and matte adhesives are acid-free and applied professionally. Additionally, your stock certificate is treated with UV stabilizing acrylic to ensure that it remains well-preserved and resists fading. All shares are 100% guaranteed as well, so you won’t have to worry about dissatisfaction. Order your single share of XEROX stock today! This certificate makes an excellent gift for co-workers or that business savvy person on your Christmas list this holiday season.